The University of Birmingham announced this morning the discovery of a new henge less than one kilometre away from Stonehenge. The new henge was discovered by a team of archaeologists led by the University of Birmingham and the Ludwig Boltzmann Institute for Archaeological Prospection and Virtual Archaeology earlier this week, just two weeks into a three-year study that forms part of the international Stonehenge Hidden Landscapes Project. 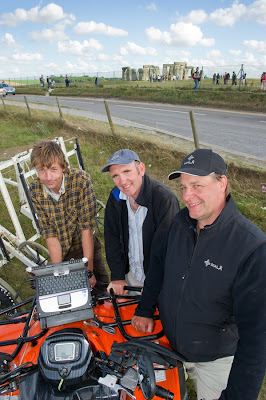 The project aims to map the Stonehenge landscape and to virtually recreate the prehistoric monument and its surroundings using the latest geophysical imaging techniques. The new henge consists of a circular ditch aligned with Stonehenge, which measures 25 metres (82ft) in diameter (five metres less than Stonehenge). It has two opposed north-east/south-west entrances and surrounds a smaller circle with internal deep pits that are up to one metre in diameter and could have held a free-standing timber structure. It is believed to be contemporaneous to Stonehenge, dating back to the Late Neolithic period between approximately 2,900 and 2,200 BC. In the words of Professor Vince Gaffney from the University of Birmingham’s IBM Visual and Spatial Technology Centre, the finding ‘is remarkable’. In an interview with the BBC, he explained that ‘a major ceremonial site of this type or of this significance’ had not been found for over 50 years. The discovery has raised many new questions about Stonehenge and the surrounding landscape, which archaeologists hope to solve as the Stonehenge Hidden Landscapes Project progresses. Prior to the construction of the iconic monument which survives today, there existed an earlier bluestone structure which was dismantled. In March 2008, archaeologists began, for the first time in 40 years, a new series of excavations at Stonehenge in an effort to throw new light on the origins of this little understood structure. Anthony Johnson reports in Solving Stonehenge. From left, archaeologist Eamonn Baldwin, University of Birmingham with archaeological geophysicist Dr Chris Gaffney of University of Bradford with Professor Wolfgang Neubauer, director of the Ludwig Boltzmann Institute for Archaeological Prospection and Virtual Archaeology in Vienna.